Mad Men's noir-ish postwar nostalgia has permeated so many aspects of today's culture, from skinny ties, to really skinny ties, to cheating on your hot wife with everyone in town, even Jewish chicks! 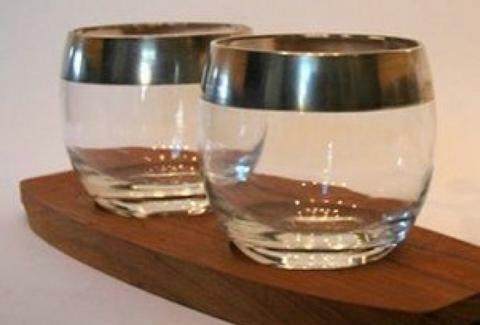 Also, drinking all day out of sweet cocktail glasses, like those made by Dorothy Thorpe. Originally produced in the 30's, 40's, and 50's, Thorpe's classily clean-lined, silver-rimmed barware's been rejuvenated by its frequent appearances in the Sterling Cooper office, and is now available at Old Town's newly opened The Hour after the shopkeep's 20 years of stockpiling led to the "largest collection on the East Coast", and hopelessly unrealistic cocktail party expectations. 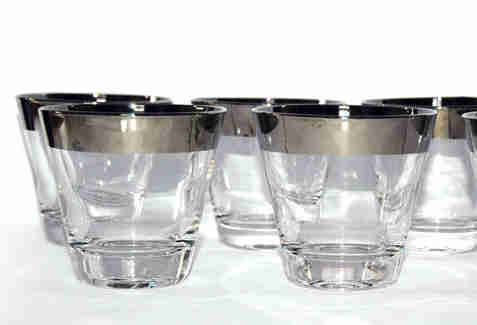 Thorpe's signature wide, platinum-banded rims're available on a set of four round-bottomed glasses dubbed "Roly Polys", one with a giant punch bowl and five smaller Rolys, and a set of eight smaller, sharper-angled rocks glasses, not to be confused with Sharper Image rocks glasses, which everyone pretends to consider purchasing before just using the massage chairs. Equally suave are her zero-mercury-containing "mercury glass" collections, which feature a near-black rim-band fading down the glass, available in an eight vessel/caddy set; a four boy/four snifter combo; and an array including an ice bucket, tray, and eight tall "Tom Collins Glasses", which Kerry Collins is prepared to use each one of. At 10am. Every morning. There's also tons of stuff for your kitchen/super-cool-office, including a tall, platinum-banded "martini/cocktail pitcher", and platinum-banded bowl for nuts that's super-squat -- the position one must assume to force out still more cultural commentary referencing Mad Men.